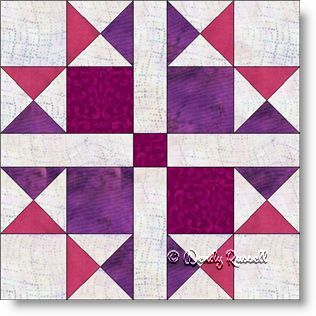 The Variable Star quilt block has many variations, living up to its name. This particular version struck me as interesting as it has two different things going for it. It uses several quarter square triangle patches and is constructed as an uneven nine patch. The centre strips that make it an uneven nine patch can omit the need for sashing strips and give visual direction while separating the patches. The two sample quilts illustrated show how very different the resultant quilts can be, simply by changing up the layout of the quilt blocks. I hope you enjoy this block as much as I did.